Wells Fargo & Company is a bank holding company. The Company is a financial services company, which offers banking, insurance, trust and investments, mortgage banking, investment banking, retail banking, brokerage, and consumer and commercial finance. It has three operating segments: Community Banking, Wholesale Banking, and Wealth and Investment Management. Its Community Banking segment offers financial products and services for consumers and small businesses, including checking and savings accounts, credit and debit cards, and auto, student and small business lending. Its Wholesale Banking segment provides financial solutions to businesses across the United States and globally. Its Wealth and Investment Management segment provides a range of personalized wealth management, investment, and retirement products and services to clients across the United States-based businesses. It operates through over 8,700 locations and approximately 13,000 automated teller machines. Twitter, Inc. (Twitter) offers products and services for users, advertisers, developers and platform and data partners. The Company's service is live-live commentary, live connections, live conversations. Its products and services for users include Twitter, and Periscope and Vine. Its Twitter is a platform for public self-expression and conversation in real time. Its promoted products enable its advertisers to promote their brands, products and services, and extend the conversation around their advertising campaigns. Its promoted products consist of promoted tweets, promoted accounts and promoted trends. Its Fabric platform offers modular software development kits that help developers build applications, gives them mobile analytics, the ability to generate revenue through Twitter's mobile-focused advertising exchange, MoPub. It offers subscription access to its public data feed for partners wishing to access data beyond its public application program interface (API). 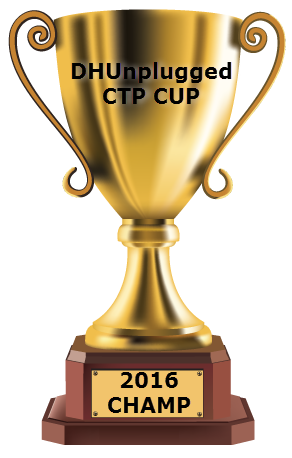 THE 2016 DHUnpplugged Cup - DIA (DJIA ETF SPECIAL CONTEST) Each month, throughout the year, we will be holding a special CTP contest for the DIA. The winner of each month will be eligible to compete in year-end final where we we will crown the champ. SPDR Dow Jones Industrial Average ETF Trust (the Trust) is a unit investment, which issues securities called trust units or units. The Trust seeks to provide investment results that, before expenses, generally correspond to the price and yields performance of the Dow Jones Industrial Average. The Dow Jones Industrial Average is an Index of 30 blue chip United States stocks. Shake Shack Inc. operates roadside burger stands. The Company serves an American menu of burgers, hot dogs, crispy chicken, frozen custard, crinkle cut fries, shakes, beer and wine, among others. The Company has approximately 84 Shacks in over 10 countries and approximately 45 cities. The Company's signature items are its all-natural, hormone and antibiotic-free burgers, hot dogs, crispy chicken, crinkle cut fries, shakes and frozen custard. Its menu focuses on food and beverages, crafted from a range of classic American foods. The Company's domestic menu includes a range of signature items, such as the ShackBurger, SmokeShack, Shack-cago Dog, 'Shroom Burger, seasonal frozen custard, hand-spun shakes, concretes, ShackMeister Ale, and Shack Red and Shack White wines. Its burgers are made with a whole-muscle blend of all-natural, hormone and antibiotic-free Angus beef, ground fresh daily, cooked to order and served on a non-genetically modified organism (GMO) potato bun. NIKE, Inc. is engaged in the design, development, marketing and selling of athletic footwear, apparel, equipment, accessories and services. The Company sells its products to retail accounts, through NIKE-owned retail stores and Internet Websites (which the Company refers to as its Direct to Consumer or DTC operations), and through a mix of independent distributors and licensees throughout the world. The Company focuses its NIKE Brand product offerings in eight key categories: Running, Basketball, Football (Soccer), Men's Training, Women's Training, Action Sports, Sportswear (the Company's sports-inspired lifestyle products) and Golf. The Company also markets products designed for kids, as well as for other athletic and recreational uses, such as cricket, lacrosse, tennis, volleyball, wrestling, walking and outdoor activities. The Company's portfolio brands include the NIKE Brand, Jordan Brand, Hurley and Converse. Biogen Inc., formerly Biogen Idec Inc., is a biopharmaceutical company. The Company operates in discovering, developing, manufacturing and delivering therapies to patients for the treatment of neurodegenerative diseases, hematologic conditions and autoimmune disorders segment. The Company markets products, including TECFIDERA, AVONEX, PLEGRIDY, TYSABRI and FAMPYRA for multiple sclerosis (MS), ELOCTATE for hemophilia A and ALPROLIX for hemophilia B, and FUMADERM for the treatment of severe plaque psoriasis. It also has a collaboration agreement with Genentech, Inc., a member of the Roche Group, with respect to RITUXAN for the treatment of non-Hodgkin's lymphoma, chronic lymphocytic leukemia (CLL) and other conditions, GAZYVA indicated for the treatment of CLL and follicular lymphoma, and other potential anti-CD20 therapies. It also develops late stage product candidates, including Aducanumab (BIIB037) for the treatment of Neurodegeneration, and Nusinersen for other programs. Fitbit, Inc. is a provider of health and fitness devices. The Company's platform combines connected health and fitness devices with software and services, including an online dashboard and mobile applications, data analytics, motivational and social tools, personalized insights and virtual coaching through customized fitness plans and interactive workouts. It offers various fitness devices, including Fitbit Zip, Fitbit One, Fitbit Flex, Fitbit Charge, Fitbit Blaze, Fitbit Charge HR, Fitbit Surge and Aria. Its platform includes wearable connected health and fitness trackers, which are wrist-based and clippable devices that automatically track users daily steps, calories burned, distance traveled, and active minutes and display real-time feedback. Its trackers also measure sleep duration and quality, and its products track heart rate and global positioning system-based information. It also offers a wireless fidelity connected scale that records weight, body fat and body mass index. Intel Corporation is engaged in the design and manufacture of digital technology platforms. The Company's segments include Client Computing Group (CCG), Data Center Group (DCG), Internet of Things Group (IOTG), Software and Services (SSG) and All Other. CCG segment includes platforms designed for notebooks (including Ultrabook devices), 2 in 1 systems, desktops (including all-in-ones and personal computers (PCs)), tablets, phones, wireless and wired connectivity products, and mobile communication components. DCG segment includes server, network and storage platforms designed for the enterprise, cloud, communications infrastructure and technical computing segments. IOTG segment includes platforms designed for Internet of Things market segments, including retail, transportation, industrial, and buildings and home use. SSG segment includes Intel Security Group, and Software and Services group. All Other segment includes Non-Volatile Memory Solutions Group and the New Devices Group.